Spinach is loaded with antioxidants and is filled with nutrients. Eating the veggie provides multiple health benefits such as improving your bone health, lowering the risk of cancer, and even helping with digestive problems. Aside from the health benefits, spinach is a superfood that can be added to almost dish. From salads to creamy pasta, spinach is a mouthwatering vegetable that even the famous 1930’s cartoon character ‘Popeye’ couldn’t resist eating a can to get stronger. However, raw spinach can go bad quickly. Raw spinach will usually go bad after 5 to 7 days, depending on how properly you store them. One way to keep your spinach from spoiling is to dehydrate it. Dehydrating spinach will not only make it last longer, but it will also make it taste amazing, is less expensive, portable, and can help reduce waste. With that being said, here are 3 ways to dehydrate spinach. Dehydrating spinach is an easy way to make your culinary experience even more convenient and exciting. Try any of these methods and you will surely not regret it. Wash the spinach thoroughly – Wash and check for dead parts of the spinach leaves to avoid contamination. Remove excess water and large stems – You do not need to completely dry the leaves. Remove the large stems; they tend to get tough when dried. Roughly chop (optional) – This step is optional as it will only aid you with grinding the spinach leaves for storage later. Lay the leaves on the trays in a single layer – Lay them in a single, even layer. You can overlap them, but do not pile them in one spot. Dehydrate at 125 degrees for 6 hours – Dehydrate the spinach for 6 hours or until dehydrated and brittle. Roughly chop (optional) – This step is optional as it will only aid you with grinding up the spinach leaves for storage later. Set your oven to the lowest setting – Set to the lowest setting of your oven (usually 150 degrees) to get closer to the dehydration temperature of 125 degrees. Lay your spinach on a cookie rack in an even layer – Lay the spinach in a single, even layer on the cookie rack. 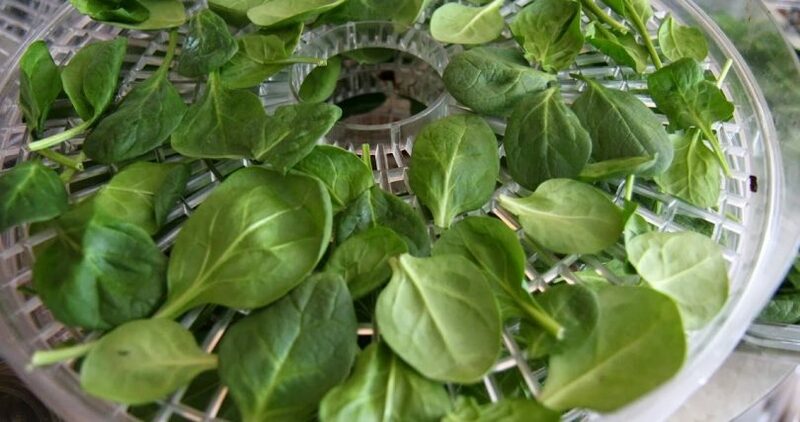 Use a cookie rack for continuous airflow for both over and under the spinach. Since the temperature is higher, dehydration time will be quicker. Dehydrate for 2-3 hours or until brittle. Remove excess water – You do not need to completely dry the leaves. Grab a handful and arrange them with the stem facing outward – Make the stems outward facing so it would be easier to tie. Tie the stems tightly with Butcher’s string – Cut around 20 centimeters of butcher’s string and tie the string tightly on the stems. Hang the spinach – Hang the spinach somewhere where it will not get hit by direct sunlight. Dehydrate for 2-3 weeks. The process takes longer since the dehydration is all natural and does not require any machinery, only natural air. This will take up to 2-3 weeks depending on how much water is still in the spinach. You will know if the spinach is dehydrated when it becomes crispy and brittle. Once you have dehydrated your spinach, all you need to do is store them properly. There are various cheap ways to store your dehydrated spinach and keep them ready to eat at all times. You can pack up your dehydrated spinach in an airtight bag. This allows you to store them neatly and just get them whenever you need them. All you need to do is grab your dehydrated spinach and transfer them to a Ziplock bag. You can also grind up your dehydrated spinach and turn them into a powder. Dehydrated spinach is very brittle and will easily crumble in your hands. Grind up your spinach by placing them in a coffee grinder or blender, and blitz them into your desired consistency. You can then transfer the spinach powder to a jar or an airtight container. Dehydrated spinach can last up to 5-6 months before turning bad. Dehydration allows the spinach to have a longer shelf life. There are many uses of dehydrated spinach. You can eat them as chips, mix them into your salads, or turn them into a powder to mix with your soup. Dehydrating spinach is an easy way to make your culinary experience even more convenient and exciting. Try any of these methods and you will surely not regret it.